Find the best New Year recipes. Enjoy all the recipes we have for you to enjoy a delicious New Year's dinner and receive January 1 on the right foot. This new year surprises all your guests with these delicious recipes that everyone will love. Here you can find from a tenderloin to delicious seafood. The best desserts to close with a flourish this year you will find here. Agree to your friends or family with these spectacular recipes. Prepare some delicious drinks to celebrate this 2015, surprise your friends and guests with this variety of cocktail recipes we have for you. Prepare the best salads to celebrate this 2015 and receive it with the right foot. From salads with fruits, to salads with cheeses. Enjoy your New Year's dinner, may it not be a nightmare! On New Year's Eve you must toast and so that you do not get bored with the usual drinks we present you some cocktails. We leave you delicious recipes of chocolate and champagne desserts to celebrate the new year that is coming. Start your New Year's dinner with some delicious snacks, from a few teaspoons of tuna to delicious salmon rolls. Lasagna is a very easy-to-cook pasta that you can prepare with almost any other ingredient. We give you these delicious homemade recipes. Enjoy the best garnishes for the new year, from potatoes with fennel, mashed potatoes, stuffed mushrooms to asparagus with vinaigrette. Did you have to bring dinner? Do not worry! Here we show you delicious and delicious recipes that everyone will love. Find delicious pork loin recipes like Pork loin in plum sauce which is an ideal dish for an elegant dinner party. Find recipes for baked pork loin, or marinated pork loin. Did you have food left over from New Year's dinner? We teach you several recipes that you can prepare and they will be delicious, cook them, you will love them. The best cooking recipes to prepare New Year, follow the videos step by step and surprise everyone at the beginning of the year. Follow the recipe "step by step"
Follow the step by step of these videos to prepare your New Year's dinner easy and fast. Did you have some romeritos and you do not know what to do with so many? Do not bore your family with the same overheated. Turn and prepare this cake Aztec! It is delicious, as well as being a very quick and practical recipe. This apple puree is very easy to prepare and ideal for any Christmas dinner. Apples cooked with white wine, sugar and a delicious touch of cinnamon that make it irresistibly delicious. The best part is that it is ready en 25 minutes! 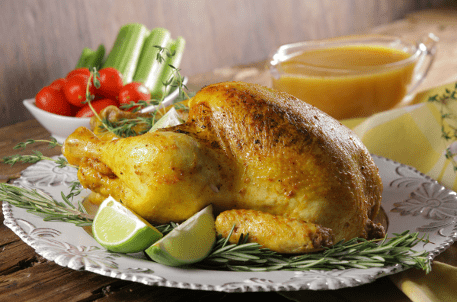 This juicy and delicious turkey is a perfect choice for Thanksgiving, Christmas and New Year, a recipe very easy and full of flavor, its rich filling and the delicious puree will be the perfect choice to accompany. The Baked Lechón for Christmas is a very typical preparation of Spain, where they call roast suckling pig. This delicious dish consists of a small suckling pig marinated in orange juice, cooked in the oven with butter and herbs like laurel, thyme, rosemary, flavored with a touch of garlic and onion. This soft meat is completely juicy and crispy at the same time. The most typical way to cut the piglet is with a dish. Prepare this delicious creamy cold paste of coditos with yogurt, blueberries, green grapes, apple and the incredible flavor of the toasted nut for this Christmas. You can prepare this delicious cold starter to garnish from days since it lasts refrigerated for days. This spectacular and everyone will love it. The stuffed puff pastry is always delicious and more if you can make an easy recipe with the reheating of the previous night, the combination of puff pastry stuffed with cod to the Vizcaína served with chile güeros will enchant you. Start a delicious Christmas or New Year dinner opening your appetite with this delicious cream of Brie cheese with cream cheese and a touch of dehydrated blueberries. Prepared with white wine, walnut and rosemary. Christmas is a time to share and what better detail to pamper family and friends than with some delicious tuna empanadas with Biscay shaped Christmas tree, with a mass of super crunchy empanadas, decorated with cherry tomatoes and parsley. Prepare this fast and delicious salad based on the reheating turkey, mixed with fresh celery, onion, walnut, purple grapes, apple and a creamy touch of mayonnaise and cream with a light taste of mustard and salt. Do you want the best recipe for Christmas cookies? Then you need to cook these Christmas Sugar Cookies. The recipe is very easy to make, especially if you use your Vitamix® to make the dough and glaze. Besides these cookies you can cook them with your children and spend an incredible afternoon with them. You can also make these Christmas Sugar Cookies and wrap them in boxes for Christmas gifts, sure everyone will love them. Make this quick and easy recipe! You like them? Prepare this healthy recipe of Red Fruit Salad with Goat Cheese and Rosemary Vinaigrette. A delicious and very easy to make recipe that will help you maintain your lifestyle during the Christmas holidays. Enjoy the fresh and rich of rosemary vinaigrette. For this Red Fruit Salad with Goat Cheese and Rosemary Vinaigrette you can choose which red fruits to use, such as raspberry, strawberry or blackberry, take advantage of its antioxidant properties. For this Christmas season accompany your favorite dishes with this easy garnish of Potato Pan with Fine Herbs with Bacon, a touch of yellow lemon and Parmesan cheese. They are the ideal complement for your dinner, since they have an easy preparation and a delicious flavor. You will no longer have to worry about finding an easy recipe to serve that day, since with these potatoes; You will have everything solved. For this pot of potatoes with fine herbs we recommend that before cooking the potatoes let them rest in water, in this way they will remove the starch and they will cook easier. If you're tired of preparing chicken in the same way, here's the solution! An easy and elegant recipe for butter chicken with white wine, perfect for a dinner or celebration. The whole chicken is injected with white wine. It is spread on the outside with the mixture of butter, lemon and spices, and then stuffed with meat and nuts. The butter helps to give a perfect brown to the chicken skin and brings a lot of flavor. Remember that you have to inject the chicken with the white wine so that when baking it the meat is juicy and smooth. We recommend using the same wine to cook the chicken to match it, as this way the flavors will stand out more in each bite. Try the butter chicken with wine, we are sure you will not regret it. Are you looking for filled cake recipes? This Chocolate Cake Filled with Pastry Cream is a delicious dessert that is very easy to make. This rich recipe combines the flavors of the traditional vanilla custard with the bitter chocolate of the sponge cake. So that this Cake of Chocolate Filling of Cream Pastelera is not so cloying, we added some strawberries to the filling and in the decoration. For what event will you like to prepare this cake? Delicious recipe for stuffed pork loin, ideal for cooking on these December dates. Pamper mom with an original green ceviche. The green dressing that characterizes it, achieve the ideal balance between the acidity of the lemon, the freshness of the mint and the sweetness of the SPLENDA Granulated. Start this new year with more luck, do all these rituals and attract luck and good vibes for the year that begins. When the 12 of the night of December 31st arrives, we think about the purposes for the new year, but many times we think about things that we will not be able to fulfill. Follow this guide on how to make realistic new year resolutions. The rituals of the new year are traditional, although we will never know if they are effective or not, it is important to do them every year. Follow these tips to start the New Year with Love. Decorate your tables for the New Year's party with this amazing centerpiece. It is perfect to celebrate and receive with all your family and friends a year coming. Do not wait any longer, your centerpieces will be the sensation.